Hello everyone! I hope you all had a pleasant weekend. We did even if it half of it was super soggy and rainy! I am linking up for Inspiration Monday with two birds today for the first time in awhile! I love this ensemble from Reese Witherspoon here. When does she not look good, seriously? 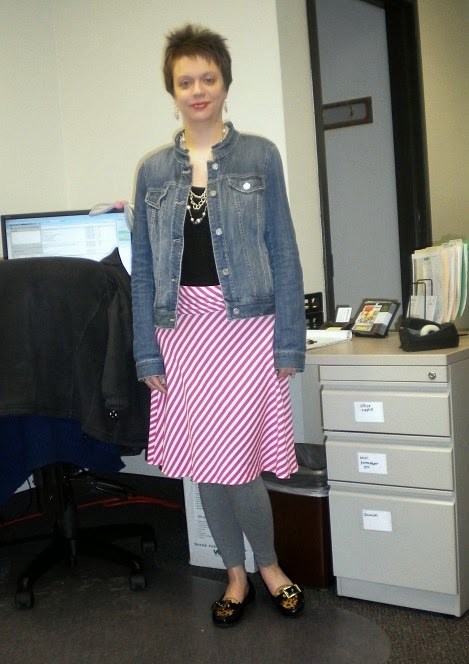 My look is a bit more subdued - I went for work appropriate and warmth since it's still rainy and cold out today. I should be wearing those pink shoes from Friday again - but let me tell you, by the end of the day on Friday I was dying. I think those shoes will be relegated to date night shoes only! 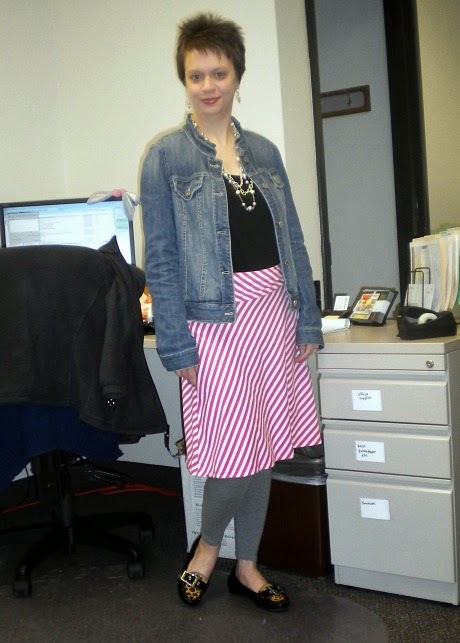 I decided to pull pink into this look instead with this fun striped skirt I found at the thrift store. As I said, we did have a nice weekend. We went to a birthday party for my friend's son - he's the first of the little batch of babies around Ollie's age to turn one. It was the first time we brought Ollie out to a gathering with other kids around his age like that. It was fun though. We took a picture of Ollie, Zac the birthday boy and our other friend's son Ben who is kind of between them in age. Oliver is almost as big as the eight month old and one year old though - makes me wonder what he'll look like by age one! Anyway, the mamas were my sorority sisters in college, so it's fun now to be raising kids side by side! Saturday evening we had the Pants Monkey's parents babysit Ollie and we went to have a game night and bonfire with some friends. The bonfire sadly was short lived as the rain started as we just barely got it lit. We retreated inside and spent some time laughing over Cards Against Humanity. It's a dangerous game to play with this particular group sometimes, but it's always good for a laugh. Sunday the rain continued and we were super lazy and it felt really good! Ollie took some great naps. As tempting as it was to join him, I was industrious instead and got a bunch of laundry done and baked some cookies. I haven't been able to do much baking since returning to work from maternity leave, so it was nice to do that! I got in a nice workout as well and then we had our favorite BBQ food for dinner after the baby went to bed and watched some episodes of The West Wing. I just love weekends like this! Sadly this rain is going to last all week. I am hoping it wraps up by Friday because we have tickets to the Twins game - I have yet to go to Target Field, so I am looking forward to it, but only if the weather cooperates! That's the story from here for now! For more Inspiration Monday outfits, head on over to two birds over here. Oh! Love the inspiration picture, the jean jacket and heels are cute! Also, love your take on it, especially that skirt! Cute outfit! I'm glad you had a good weekend! I really want to get cards against humanity, it sounds so fun! And I saw the babies pic on Insta and thought how fun it is that you all get to hang out with close-age kids! You look super cute, but you know I'm going to love anything with a denim jacket on it. ;-) I really like your skirt and that sounds like a fun, jam-packed time. Ooohh... nice skirt. And cookies?! Leave some out for me, please. I love that you added pink with the skirt (and stripes too, my fave!). That picture of those boys...adorable!! Glad you got some time to bake over the weekend. I've got to do that soon! You look adorable! And Ollie is so cute! We have had some really interesting games of cards against humanity.